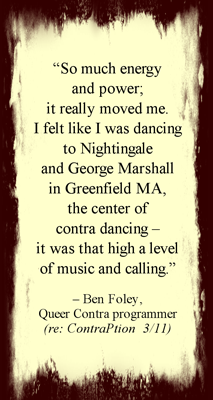 Contradance Calling Schedule | Indigenize! 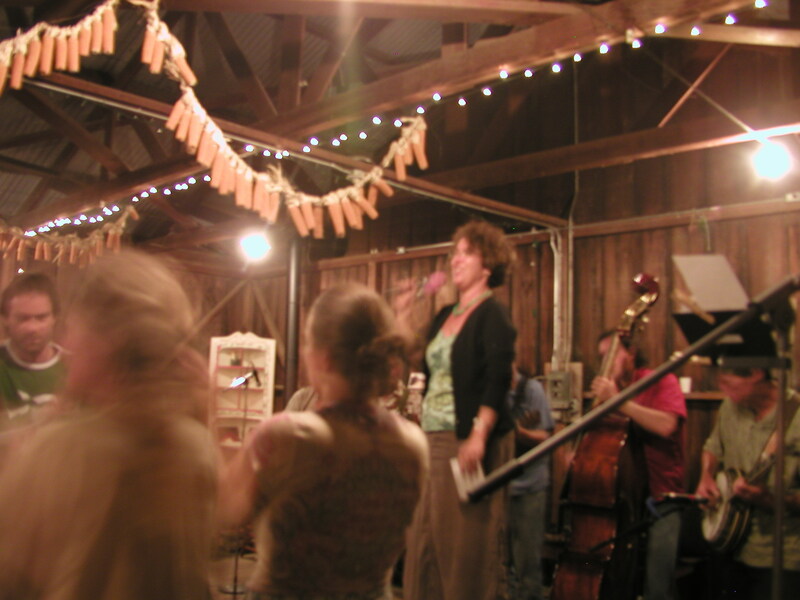 Tina Fields calls contra dances, singing squares, community “barn” dances, simple medieval dance, and sacred circle dances, with the goal of creating maximum joy for all. Dancers and musicians say Tina is known for her “effervescent sparkle, great sense of timing, clear enunciation, singing style, patience with new dancers, collaborative way of working with bands, and comfortable humor.” Her day job skills (as a college professor) help make her dance teaching clear, concise, and accessible to different kinds of thinkers. 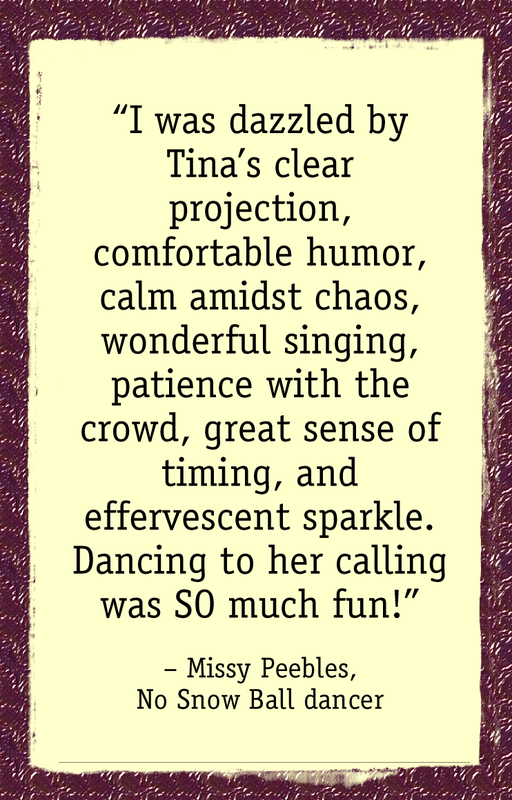 Tina is also a versatile singer, ceremonial facilitator, and storytelling orator. 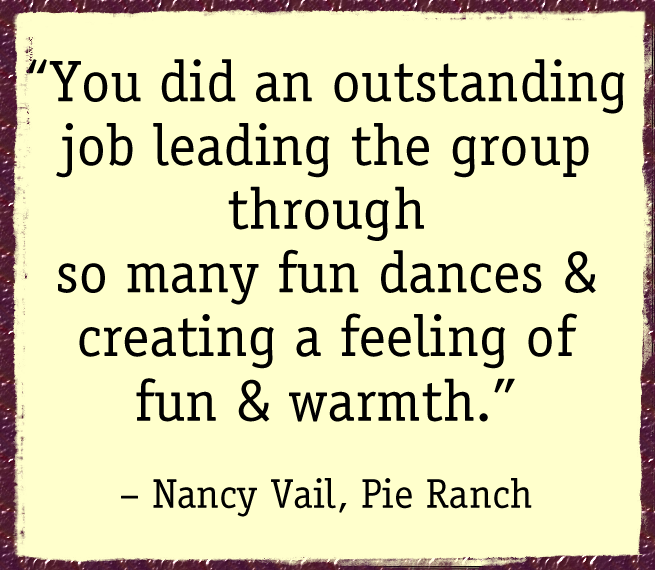 She has been on staff for dance/music camps as both contradance caller and songleader. Scroll down for current schedule, videos, & calling history. For venue directions and other information, please click on highlighted words. April 5, 2019 Family Dance, Boulder, CO, with the North Valley Tune Tanglers (Liz Stevens, Michael Gallagher and Rick Olcott, from New Mexico). April 6, 2018 Boulder, CO – Contra 8-11, with Swing Time (Kate Kerr – fiddle, Ed Secor – clarinet, Barb Kirchner – keyboard, Brett Bowen – dumbek, tupan). 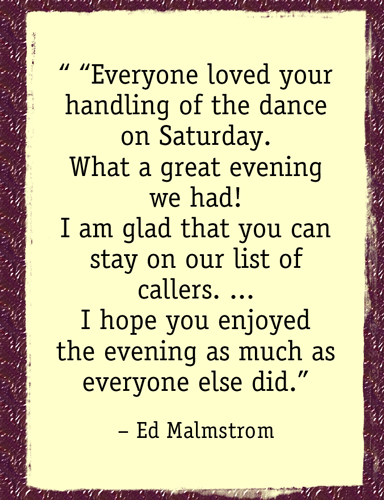 CFootMad’s first “Larks & Ravens” Contradance! Many dance communities are switching to gender-neutral language, in order to promote inclusivity and encourage new, young, and diverse dancers. If you are curious about experiencing this evolving form, now’s your chance! Our experimental Boulder dance will be run the same as always: the usual familiar contra moves danced to the excellent quality live music we’ve come to expect. 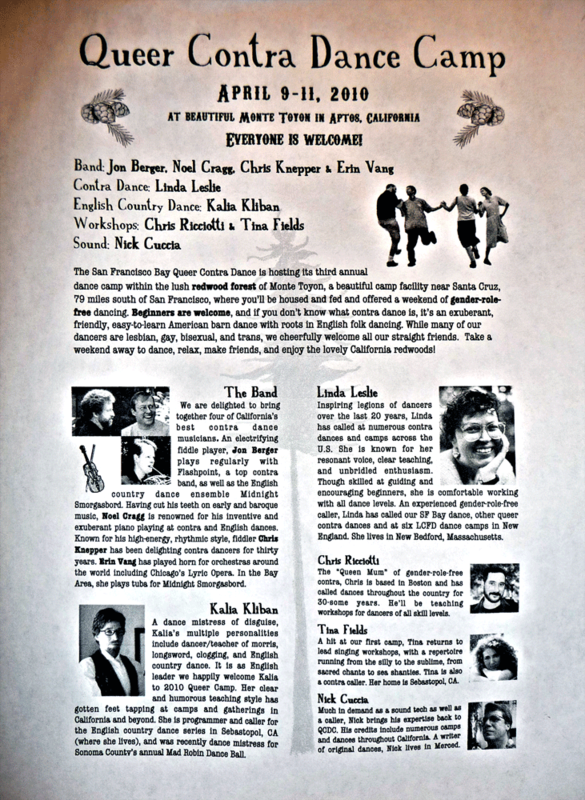 The only difference is that the terms “larks and ravens” denoting the Left and Right role positions will be used in place of the usual gendered terms “gents and ladies.” As always, anyone is welcome to dance any role, and those who want to dance their usual role are completely welcome to. We only need remember that a rose by any other name smells as sweet. Experienced dancers who would like to try a different role (whether this eve or any other), please come to the pre-dance beginners’ lesson where you can try out the few role-specific moves with gentle repetition. December 1, 2018 Fort Collins, CO – Contra, co-called with Ed Hall to the music of the Offbeats: Joel Hayes (fiddle), Ed Secor (clarinet & sax), Larry Clyman (guitar) & Tod Ball (bass). Theo’s 90thbirthday: entrance only $4! February 23 – 26, 2017 Stellar Days & Nights dance and music weekend, Buena Vista CO.
With Larry Unger (guitar, banjo, bass, jaw harp…) and Karina Wilson (fiddle), Balance and Swing (Sue Reading – fiddle, John Reading – keyboard, & Tina Gugeler – hammered dulcimer), and co-caller Ed Hall. Lead With Your Body. 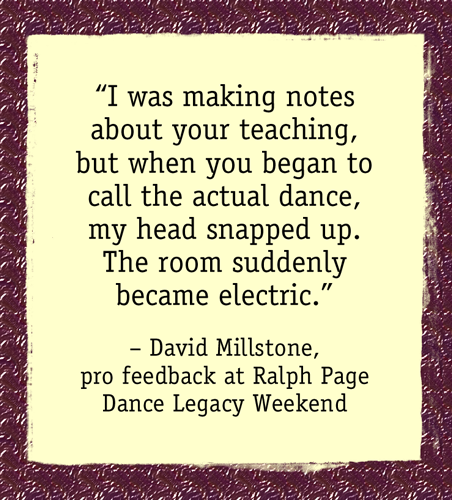 We will experientially broaden our awareness to the way that non-visual cues like gentle hand or body language can guide fellow dancers and help us to more deeply connect with everyone on the floor. The session will include a playful experiment in blindfolded dancing. Fomenting Momentum, Flow and Fun. In this session, we will play with ways in which to create a more delicious dance experience through flowing like melted butter from one figure to another, and creating momentum at key elements in that flow while safely sharing weight. Bawdy British Ballads. Sing, laugh, and possibly blush as we sing shockingly bawdy ballads of yore, ranging from cautionary tales to carnal celebrations. (Oh my!) Many feature an easy-to-sing chorus, so you do not have to be a “good singer” to join in. If you have your own favorites, bring them along to share. October 27-29, 2017 Boo Camp Contradance weekend put on by NM FolkMADS. With 44% Dandelion (Karina Wilson and Doug Goodhart) and the North Valley Tune Tanglers (Liz Stevens and Mike Gallagher) & co-caller Ed Hall. Hummingbird Music Camp, Jemez Springs, New Mexico. Feb 5, 2016 Family Dance, Boulder CO with Caroline McCaskey (fiddle), Sherilyn Welton (from NM, cello), & Teri Rasmusson (piano). 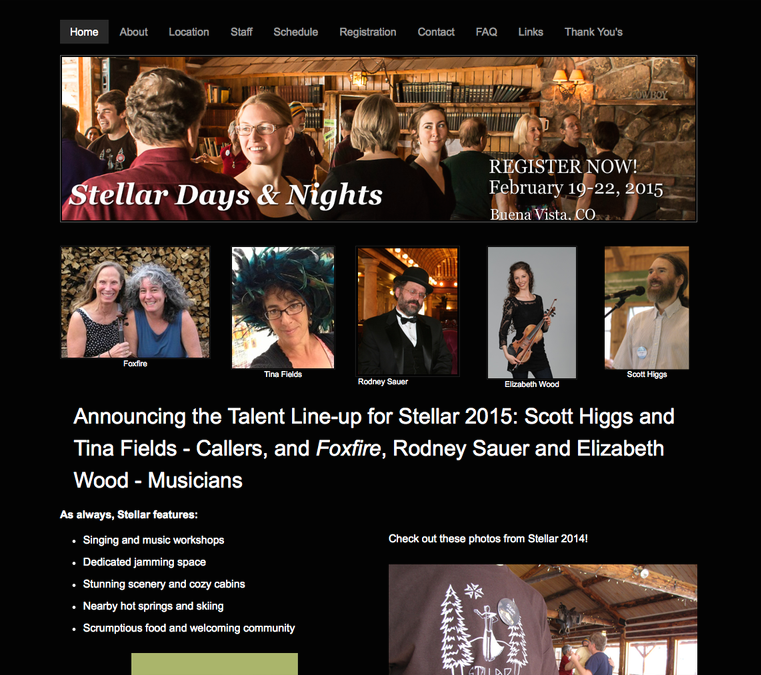 February 19-22, 2015 Stellar Days and Nights dance camp, Buena Vista, CO, with Foxfire (Karen Axelrod & Daron Douglas), Rodney Sauer & Elizabeth Wood, and co-caller Scott Higgs. 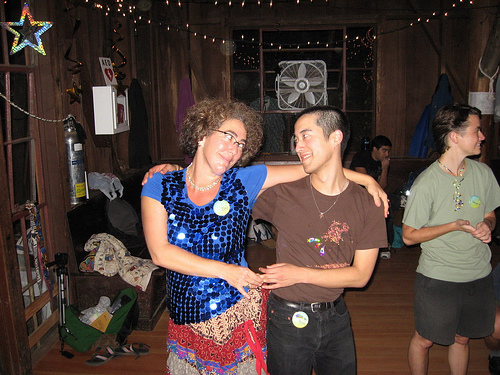 My part: contradance calling, a genderplay dance workshop co-led with Erik Erhardt, and two singing workshops. June 27, 2015 Wedding of Karen Ikegami and Andy Jennings, with Lizard Spring (Dave Brown –fiddle, Tom Kurtz – banjo, Dave Parman – guitar, Pat Carbone – bass). Lone Hawk Farm, Longmont CO.
September 25-27, 2015 Mountain Moon Festival. 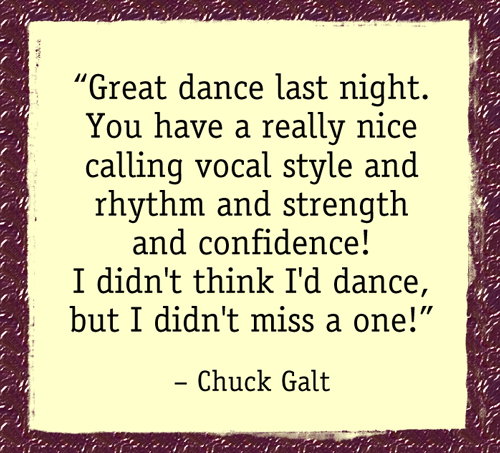 Weekend music and dance event at Colorado Mountain Ranch (near Gold Hill) CO. Friday night dance with Mike Moorman, Kate Kerr & Mike O’Donnell. October 10, 2015 The Avalon Ballroom’s 10th Anniversary Celebration/Dance Party. Boulder, CO. Event 3-10 pm; I call Family & Contra dances beginning around 6. May 16-18, 2014 Planters Moon Festival. Weekend music/dance camp. Colorado Mountain Ranch (near Gold Hill) CO, with The Stuart Brothers (Trevor and Travis Stuart, from North Carolina) Event Cancelled due to 2′ of snow and frozen pipes! Tina Fields calling with KGB at the Petaluma, CA contradance, Nov 5, 2012. Click the links immediately following to view. This dance is Erik Weberg’s “Ad Vielle (Oddville),” written for the tune “Oddville Cupola” by the fine fiddler you see playing here, Claude Ginsberg. November 3, 2012 Fall Has Sprung – 12 hour dance in Grass Valley, CA, with KGB (Dave Bartley, Julie King, & Claude Ginsburg) and Hot Cider (Ken Nilsson, Rudy Darling, & Barry Angell). Sharing the event with co-callers Frannie Marr & Joyce Miller, and 3rd faboo band Raz de Maree, a.k.a. Tidal Wave (Rachel Aucoin, Sabin Jacques, Stuart Kenney & Eric Favreau) *** Click here to read my blog post about this dance, including video. December 25, 2012 Fort Collins, CO “Holidance,” with Eric Levine and friends. Come unwind from the holidays with an evening of contras and waltzes. January 5, 2011 Berkeley, CA contra with Swing Farm (Ray Bierl, Charlie Hancock & Ran Bush). Open band included percussionist Doug Palmer. January 8, 2011 Barn/Contra Dance for Biodynamic Farming and Gardening Association (BDANC) winter meeting, Frey Vineyards, Redwood Valley, CA, with Laura Smith, Darin Smith, Cliff & Julia Landis. April 15, 2011 Girl Scouts Father-Daughter “Me and My Cowboy” barn dance, Danville, CA, as ContraPtion (calling partner singing-squares-kudowith Jon Berger, Erin Vang & Noel Cragg). Sept 10, 2011 San Rafael, CA contra Moving to Boulder, Colorado! Feb 20, 2010 San Francisco Bay Queer Contra Dance Road Trip, Santa Cruz, CA (Gender-Free), with Chris Knepper, Craig Johnson, & Erin Vang (on tuba!) The eve includes one experimental Techno contradance. March 6, 2010 Monterey, CA contra, with Engle Ryan Peterson (ERP): Dan Engle, Art Peterson, &, Pat Ryan. June 27, 2010 Just Because It’s June! Guest songleader at Doug von Koss’ “midsummer evening for Men & Women full of Love & Chant & Community & Song.” Berkeley, CA 7-9:30 pm. July 10-17, 2010 BACDS English Week Dance Camp. Mendocino Woodlands Camp, CA. Singing workshops, group songleading for Pub Night, Beatles/60s singalong, and High Tea. August 2010 * Roll up: I’m now the official caller for ContraPtion! Woot! Woot! Kalia Kliban is the equivalent caller for the band’s English Dance persona, Midnight Smorgasbørd. 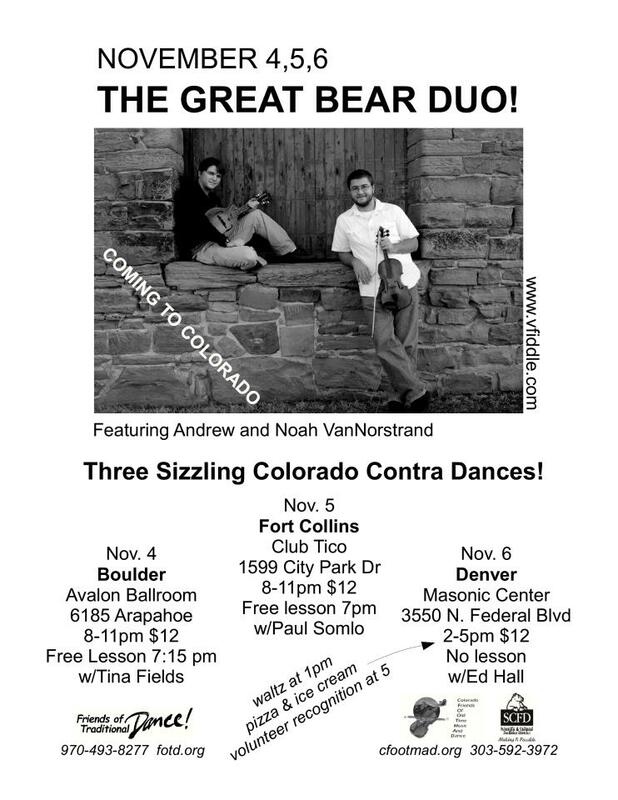 Nov 17-21, 2010 Academic presentation about contra, Trance Induction through Contra Dance: Weaving Communitas. American Anthropological Association conference, New Orleans, LA. 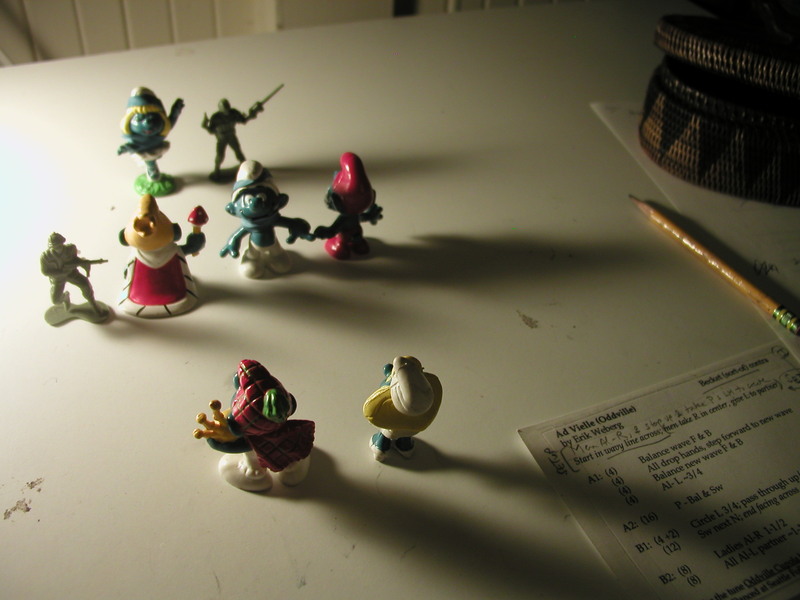 Nov 19 – Dec 17 EnChantMent! Open group songleading. Series of four Thurs eves 6:30-8:30. TreeGirl Studios, Sebastopol CA. 10/15/08 Berkeley, CA contra, with Open Band led by The OpporTunists (Alan Snyder, Topher Gayle, & Erik Hoffmann). 2/16/07 Santa Rosa, CA contra – guest spot with Celia Ramsey and Bandemonium! 11/10/07 Reno NV contra, with Moonlight Hoodoo Review (Bill McKean, Zeke Griffin, Scott Gavin, Reuben Estrada & Robert Kastelic) — my first whole evening of calling! Aug 2006 Contra Callers’ Course with the amazing Lisa Greenleaf (participant in weeklong intensive), CDSS American Dance & Music Week at Pinewoods, MA. Also called on Campers’ Night with open band. Lisa Greenleaf, Hank Fields, Chris Ricciotti, Ralph Sweet, Nils Fredland, Erik Hoffmann, Susan Petrick, Carol Ormand, Lynn Ackerson, Andy Wilson, Karen Fontana, Chuck Galt, Michael Barraclough, Susan Michaels, Joyce Miller, the excellent callers’ discussion listserv sharedweight.net which has provided some terrific tips – and, of course, Bugs Bunny. And the biggest thanks to all of you contradancers! I see that you are busy calling the week of June 4. We are having a barn dance on Sat june 5 here at Hidden Villa. Could you recommend a caller to us, and are you interested for future events here? Sweet. I really enjoy reading this blog. Keep up the good work. 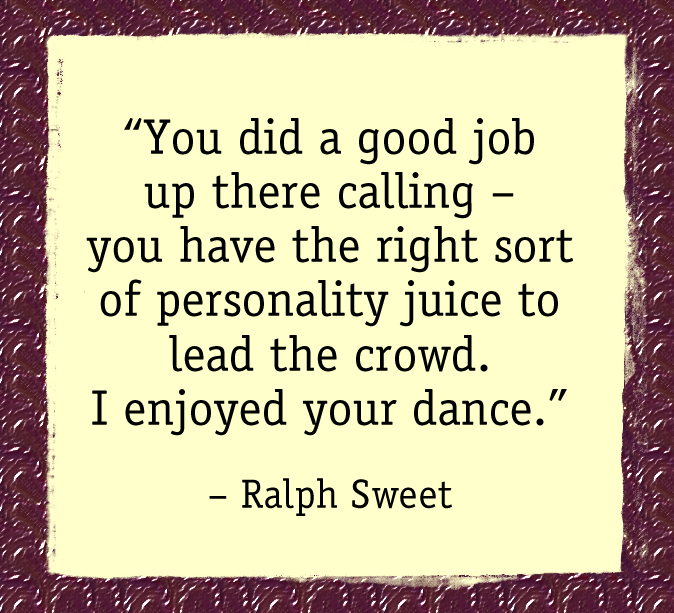 Want to know the kind of people you’ll meet at a contra dance? Check out this recent announcement for the Santa Rosa dance on Facebook, and the sort of shenanigans that ensued. Did you like my awful pun? You know what they say: use a pun, go to jail! You are incorrigible, Moira. People, do not incorridge her. Sheer tomfoolery! If you carrot all what I think. Wish we could turnip at the dance, but I’ll be out of town. You folks are the grapest! I’ve got a crush on you….